Most weeks, New York Magazine writer-at-large Frank Rich speaks with contributor Alex Carp about the biggest stories in politics and culture. Today: NBC’s disastrous presidential forum, allegations of a Trump pay-to-play, and Fox News without Roger Ailes. 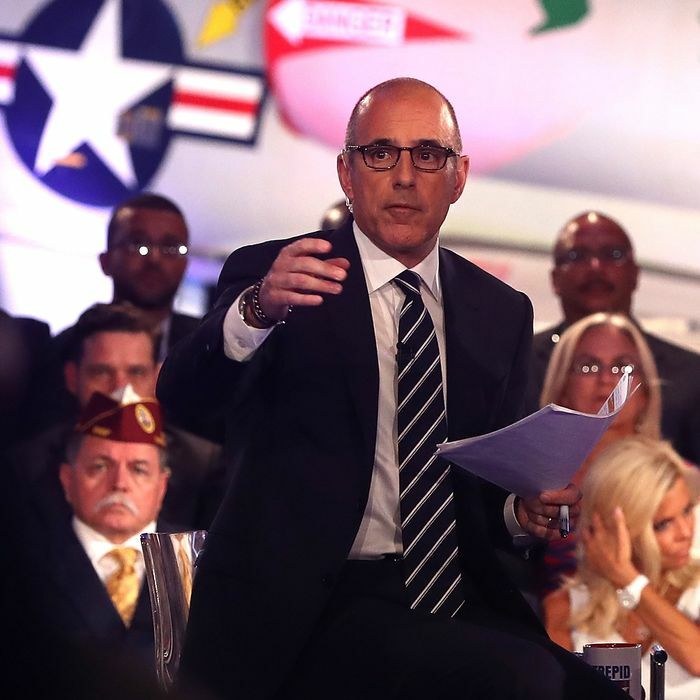 Before Wednesday night’s presidential forum had even ended, reporters and fact-checkers were picking apart Matt Lauer’s failure to challenge Donald Trump’s false statements and attacking the parity of his questions. What should the moderators of the upcoming debates take from this? The moderator of the first presidential debate on September 26 is Lester Holt — like Matt Lauer, an NBC News anchor. If he arrives onstage as poorly prepared as Lauer, and behaves as boorishly toward Hillary Clinton as Lauer, the first debate, likely to be the most-watched presidential debate in the history of broadcasting, is going to be a debacle for the country. Much ridicule, all deserved, has been aimed at Lauer’s laughably empty reservoir of facts, particularly when questioning the fact-free Trump. (“Questioning” may be an overstatement in this context; Lauer didn’t question Trump so much as feed him anodyne cues to spew any hooey he wanted.) The most widely panned example of the moderator’s failure is particularly galling: Clinton herself said in the forum’s opening round that Trump was initially in favor of the Iraq War, having said so on Howard Stern’s radio show in 2002. But Lauer didn’t even listen to her. When Trump said just minutes later that he had been against the war from the start — and cited a 2004 Esquire article as proof — Lauer not only failed to challenge the conflict between what he said and the truth cited by Clinton but seemed oblivious to the fact that the Iraq War began in 2003. And let’s not forget that interlude when Trump was claiming that Vladimir Putin is a superior leader to Barack Obama — an outrageous argument that Lauer never challenged. To prove his point, Trump cited “polls” that give Putin an 82 percent approval rating. What polls? Lauer didn’t ask. I dare say Trump could have cited Chinese polls from the 1960s that gave Mao a 100 percent approval rating, and this moderator would have just nodded and moved on to the next topic on his crib sheet. Lauer came armed with a lot of follow-up questions about Clinton’s email server — fair enough, if he had also brought along follow-up questions for Trump. But he didn’t. When the former Marine officer and National Book Award–winning author Phil Klay (Redeployment) asked Trump how he’d handle the postwar aftermath of deploying American troops overseas, Lauer (who seemed to have no idea who Klay was) let Trump skate off with a bunch of nonsense about grabbing Iraq’s oil rather than ask a follow-up or permit one from the better-informed Klay. Is Lauer a Trump supporter? I doubt it. But his incompetence and double standard have handed Trump a big post–Labor Day gift just as the polls are tightening. Trump is fighting allegations that a decision by Florida attorney general Pam Bondi not to pursue an investigation into Trump University had anything to do with a 2013 donation he made to her campaign (or the fundraiser he hosted for her later, at Mar-a-Lago). Trump has been gloating about buying political influence since the early days of his campaign — does this change anything for his supporters? Of course not. As I’ve said before, there is one thing Donald Trump has said that I firmly believe is true: “I could stand in the middle of Fifth Avenue and shoot somebody and I wouldn’t lose voters.” If Trump’s base has remained faithful to him through every other scandal that has surfaced over the past year, this one is hardly going to make a difference — even though he’s been caught lying about it. (He had said he’d never spoken to Bondi about a contribution; Bondi’s own adviser told the AP in June that he did.) Besides, Trump has already implicitly admitted guilt by repeatedly bragging since the start of his campaign that he has used donations to buy off politicians (the Clintons included). His partisans, in any event, believe Clinton is the more corrupt no matter what he says or does. While that’s not true, the Clinton Foundation keeps providing embarrassments Trump and his backers can point to. Just as the Bondi pay-for-play story broke, the Washington Post reported that Bill Clinton had received $17.6 million from 2010 to 2015 as “honorary chancellor” of “a for-profit college company called Laureate International Universities,” a more legit operation than Trump University but not exactly an altruistic or significant educational institution. Laureate also gave millions to both the Clinton Foundation and through the Clinton Global Initiative. None of this is illegal; all of it smells of buying influence. One may believe that the debate over the Clinton Foundation’s transactions with corporations and potentates seeking entrée to a Clinton State Department or White House is overblown. One may feel the same about the questions surrounding Clinton’s unprofessional and irresponsible handling of her emails. But what is not ambiguous is this: Most Americans, including many Democrats and independents, don’t trust Clinton, and no matter how many examples surface of Trump’s bottomless record of scams and corruption, his malfeasance is not going to translate into more trust for Clinton. She’s going to have to improve her standing by making herself more available to the press and public in unscripted settings and by taking responsibility for her mistakes in human language rather than the lawyerly boilerplate she used again in last night’s forum. In the coming battle over whose supporters turn out on Election Day, she needs voters to feel motivated to vote for her, not just against Trump. Fox has not only settled the lawsuit brought against Roger Ailes by Gretchen Carlson, but it has also settled with a “handful” of other accusers, and none of the $20 million going to Carlson will come from Ailes’s pocket. How much will this saga change Fox News? Very little, it seems, given that Bill Shine, Ailes’s top lieutenant, has now been put in charge of the network despite the evidence, as reported by Gabriel Sherman, that he at the very least looked the other way at Ailes’s sexual thuggery and possibly enabled it. But, as I first argued in 2014, liberals and Democrats should stop worrying so much about Fox News; its monochromatically white and increasingly geriatric viewership is large (by cable news standards, not overall television standards) but dying off. It is the GOP base, and it will remain loyal to the party even if Fox News were to change its ideological stripes tomorrow or vanish altogether. It’s not too likely that many Americans who don’t watch Fox News might stumble innocently into its confines, watch Sean Hannity, and suddenly become right-wing zealots. Fox is far better at preaching to the converted than making converts out of nonbelievers. Fox News can’t tilt the 2016 election toward Trump. But as we saw in last night’s farcical forum, NBC News, parent of the liberal-leaning MSNBC, just might do so if it doesn’t get its act together by September 26.